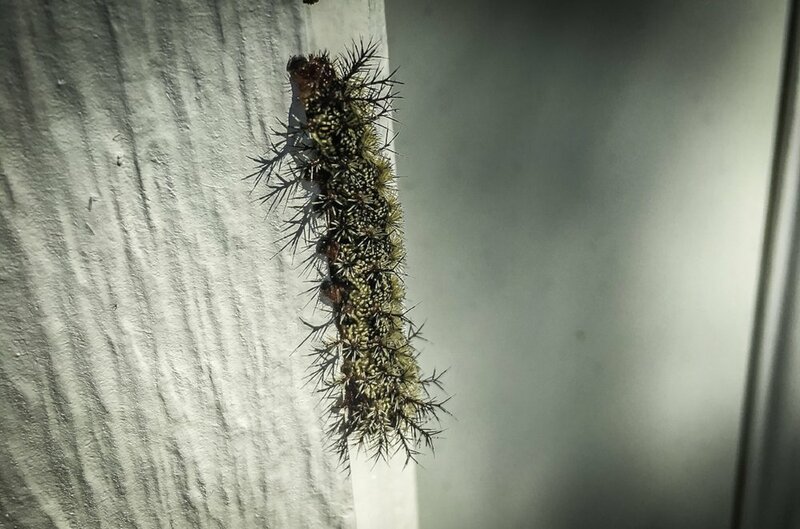 In South Louisiana we deal with these caterpillars every Spring. Anyone who has come in contact with one will attest their soft fuzzy look is deceiving as they have a very harsh sting if you are in contact with one. They are abundant in and around live oak trees where you will see them crawling on and around the surface of the tree. They often fall from the branches onto your yard, house, and vehicles. Now is the time to pay attention to where you sit outside and where you have children play. You don't want to get stung! This all starts with the unusual appearance of moths flying about in the month of December. Some years they are abundant, other years not so much. These moths are recent maturing buck moth pupa (cocoons). Their job is to mate and lay eggs in live oak trees. Several months later in March or April, the eggs hatch and small caterpillars emerge. As they feed on the oak trees they increase in size and also stinging capacity - really bad stinging capacity. If control procedures are started early when the buck moth caterpillar is small, usually they can be eliminated. Treating them early is the most effective and allows for smaller dosage of chemical application. If not treated, the neighborhoods with live oak trees will be invaded by these stinging pest. The sting is caused by hairs or bristles on the body of the caterpillar. Some people are highly sensitive to the toxin in these hairs and require medical attention. Sourced from an article on Fox8live.com, Dr. James Diaz of LSU Health Sciences Center shares advice on how to cope with the painful sting. The toxins in the caterpillar's spines cause the pain. To avoid the sting, Dr. Diaz says resist the urge to swat or brush away a caterpillar. "Just take a little stick or a pencil or anything other than your hand and gently lift them off." If you're stung, you should first wash the area with soap and water. To avoid further imbedding the spines, allow the wound to air dry or use a hair dryer. Dr. James Diaz suggests, "The best thing to do is to find some duct tape or scotch tape and use it to try and pull the spines out because they're continuing to inject the toxin." An alternative is to paint the area with clear fingernail polish, rubber cement or even a facial peel solution. Allow that to dry, then peel off to remove the toxic spines. To soothe the stinging and itching, apply rubbing alcohol, ammonia or an ice pack. Topical and oral antihistamines may also help relieve the symptoms. Twenty years ago the buck moth caterpillar was very abundant in New Orleans, with its plentiful oak tree stands. Dial One Franklynn Pest Control, and other licensed horticultural services in the area were contracted to apply specific low toxicity pesticides to stem the population. Each company was given a geographical location to treat. The effectiveness of the treatment was monitored and retreatments were required. As with all biological organisms, the buck moth population receded naturally. If you have concerns are need your property to be treated, please give us a call at Dial One Franklynn Pest Control. Newer PostHONEY BEES : "How Sweet It Is"